We asked the designer of this bright, contemporary space to reveal how it all came together. Lucky for us Krista Watterworth, the founder of Krista Watterworth Design Studio, out of Palm Beach, Fla., didn’t stop there. Read along as she shares her top designer tips and tricks for recreating this chic monochromatic space. 1. What were you trying to accomplish with the design of this space/project? I wanted to create a wonderful flow to the entire first floor of this large home, allowing all elements to come together without colliding. It’s a beautiful creamy soft wonderland which layers textures and patterns all in the same color family, so it blends without being boring or stagnant. 2. What is your favorite part of the project and why? 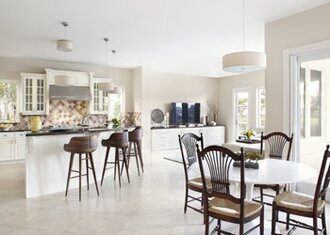 I love the kitchen stools (left). They are made in Brooklyn, and I’m a New Yorker at heart. 3. What was the inspiration for the project? The inspirations for this project were to let in the light, play on the openness and beauty of the exterior setting, and allow the home to be a canvas to the paradise awaiting outside. 4. How did you choose the color palette? Warm and clean were my color buzz words. I wanted the home to feel as open as possible so I kept all the walls in similar hues. 5. What element did you start with? Funny you should ask because I had a swatch of Kravet RIAD-116 in ivory. (This fabric swatch is similar to the tile patterned upholstery on the living room chairs.) Linen provides such beautiful texture to any space, it’s an ancient fabric and I use it in almost every project. 6. How did you begin the design process? I started with a concept board that included inspirational images and big dreams for the space, then worked my way back from there. I also always ask my clients a list of 20 questions to gage their personal style. 7. What are your tips for someone trying to recreate the look of this project? Keep your choices clean and contemporary—lines should be simple—and keep the style current with pops of authentic and rustic wood elements and relatively monochromatic hues. 8. What is your favorite designer trick? Mixing high-priced and collectible items with more budget-friendly pieces in such a way that no one can tell where you saved and where you splurged. 9. Finish the sentence: Every room needs _______. Love! If I don’t put a personal touch into every space then I can’t call myself a well-informed interpreter of style. 10. What is your best piece of advice for someone who is redecorating their home? Keep walls and larger elements neutral. The biggest mistake a novice designer makes is color choice. It takes a keen eye to work with bright and saturated color without it being too jarring and off-putting. See more from Krista Watterworth Design Studio in our Inspiration Gallery.